I love NanaCompany's recent dresden delights (http://nanacompany.typepad.com/nanacompany/2011/08/-playing-with-dresdens.html) & thought I could maybe have a go.... BIG MISTAKE!! So I'm now asking you, on bended knee, does anyone know how to (easily) do the wee rounded bits at the top... I've done the pointy ones before.... and I really don't want to needle-turn them.... So if you could give me any advice I would be eternally grateful... really! Hi I paper pieced mine by hand, not sure how else. That looks rather difficult, I would be interested to read what you discover. How about ironing them to a freezer paper template, holding the seam allowance with starch (spray some in the lid and paint it on with a cocktail stick) and then machine appliqueing them? Depending on the curve you may have to clip the seam (cut little notches out) but it would be worth trying without and seeing if you could get a good result...good luck, it's going to be lovely! 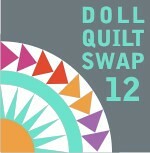 Hi just found your blog through Brit quilt and am now a follower. Can't help on the dresdens sorry but love the quilt you made for the swap. Sew your plate all together. Lay it face side down on lightweight fusible interfacing, with the gluey side of the fusible facing up. Sew with an 1/8th inch seam allowance. Turn right side out through the hole of the dresden plate. Smooth the rounded petals of the plate with your fingers. Place carefully on your background fabric and press. The fusible will hold it in place. 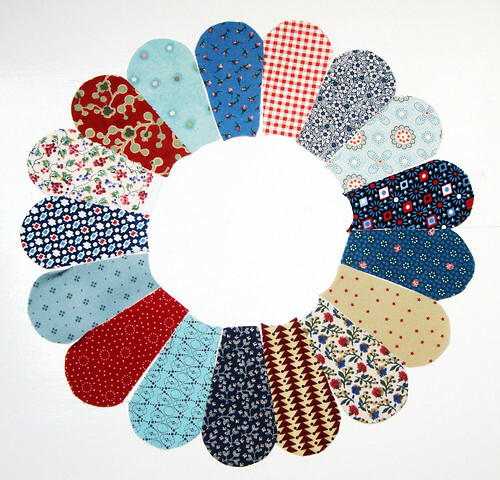 Make your center circle the same way, using fusible interfacing as a 'facing' and cutting a hole in the fusible to turn right side out. Place carefully on your plate fabric and press. The fusible will hold it all in place until you sew it down. I use a buttonhole stitch, but any stitch will do. Some people use fusible web instead of the interfacing, it's up to you. Let me know if you have any questions. I use the template method, and needle turn... but I once saw a seasoned quilter do a running stitch around the curves, then she flipped it over so that you saw the back and pulled the strings around each one, using a spoon to help shape the curves. She pressed with starch after the shaping. Thanks so much for these funny/helpful comments. I'm sorry I haven't worked out yet how to email you individual replies (I'll add it to my never-ending "to do" list). Anyway, I think I have the curve sussed... so stay tuned for the next blog entry!! I've seen them too lovely aren't they? I'm still to attempt them so I can't offer any helpful advice I'm afraid but I'm looking forward to seeing how you get on. Hello. 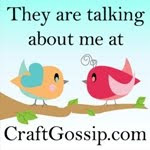 Just found your blog via Quilting Gallery and will be following with interest. Sorry, can't help with the Dresden block. I love some of the suggestions you have gotten, and will be interested in seeing what you do. Good luck. Can`t help either but I`m sure it`s going to look great - seems you have some amazing advice!